This biker finished 30 minutes faster than the taxi, and probably cut less people off too! Running late? Grab a bike. For the fifth consecutive year, cycling beat out the subway and taxi in the Transportation Alternative’s annual commuter race. This year the race took off from Sunnyside, Queens and ended in Columbus Circle. 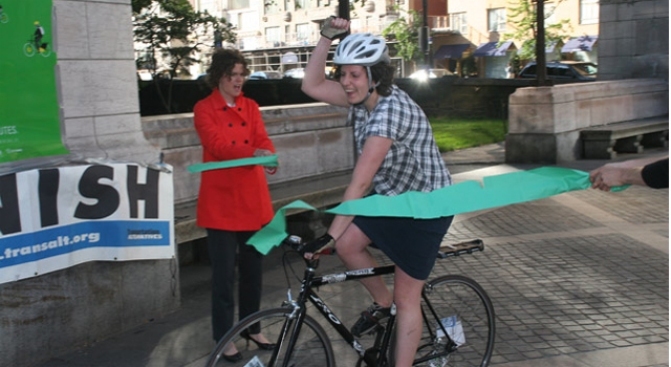 It took librarian Rachel Myers 20 minutes and 15 seconds to pedal the 4.2 miles during the morning rush. Subway rider Dan Hendrick - who hopped the No. 7 in Sunnyside and transferred to the No. 1 at Times Square - arrived 15 minutes after the biker. A yellow cab rolled up to the finish line with a finishing time of about 47 minutes – nearly half an hour after the cyclist -- and costing passenger Willie Thompson $30. The bike, of course, is also the most environmentally friendly option with no carbon emissions. As the city celebrates bike month, Transportation Alternatives reminds commuters that with more than 600 miles of bike paths in the city, cycling is more efficient than ever. "I think there's no commodity more important to New Yorkers than their time," said Willy Norvell. "And clearly, if you've got somewhere to be in a hurry, riding a bike is the way to go."